Deserted, did I say? But not so. The lecture that day had been upon the Elementary Principles of Flight, and they lingered yet. Upon the Blackboard was the illustration you see in the frontispiece. "I act in the direction of the arrow R, that is, more or less, for the direction varies somewhat with the Angle of Incidence and the curvature of the Surface; and, strange but true, I'm stronger on the top of the Surface than at the bottom of it. The Wind Tunnel has proved that by exhaustive research—and don't forget how quickly I can grow! As the speed through the air increases my strength increases more rapidly than you might think—approximately, as the Square of the Speed; so you see that if the Speed of the Surface through the air is, for instance, doubled, then I am a good deal more than doubled. That's because I am the result of not only the mass of air displaced, but also the result of the Speed with which the Surface engages the Air. 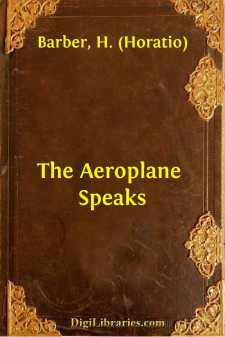 I am a product of those two factors, and at the speeds at which Aeroplanes fly to-day, and at the altitudes and consequent density of air they at present experience, I increase at about the Square of the Speed. "And I," said the Propeller, "I screw through the air and produce the Thrust. I thrust the Aeroplane through the air and overcome the Drift; and the Lift increases with the Speed and when it equals the Gravity of Weight, then—there you are—Flight! And nothing mysterious about it at all." "I hope you'll excuse me interrupting," said a very beautiful young lady, "my name is Efficiency, and, while no doubt, all you have said is quite true, and that, as my young man the Designer says, `You can make a tea-tray fly if you slap on Power enough,' I can assure you that I'm not to be won quite so easily."